Lonely And Frustrated: These May Be The Worst Jobs In Politics : It's All Politics There are always losers in politics. But even some of the winners wind up so badly outnumbered that accomplishing anything is a rare treat. On the surface, their jobs might seem so hopeless that you wonder why anyone took them on. 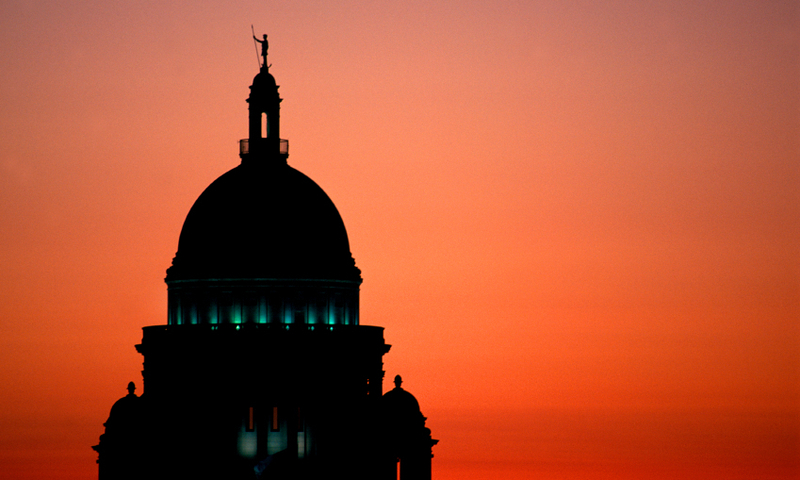 Democrats have dominated Rhode Island's Capitol building in Providence for decades. One state Republican says it's an "uphill battle" to sell voters and candidates on the GOP's message. Politics is filled with thankless jobs. It's the nature of the business that plenty of people have to work for highly demanding egomaniacs. Among elected officials, few relish having to spend big chunks of their time asking other people for money, one of the essential chores. There are certain jobs, however, that appear from the outside to be so hopeless that you wonder why anyone agreed to take them on. Running the Republican Party in a state that is sapphire blue, for instance, or being one of the few Democrats in a legislative chamber with an overwhelming GOP majority. NPR spoke to a few individuals who hold such jobs about the challenges they face, and occasional moments when they feel like they're able to make a difference. Ann Clanton says it can be "quite lonely" being an African-American woman who is a Republican. Helping to run the party in a state dominated by Democrats makes it worse. "We're in one of the bluest states in the nation," says Clanton, who is the executive director of the GOP in Rhode Island. "We have an uphill battle getting people to stay engaged with the platform of the Republican Party right now." Rhode Island politics have been ruled by Democrats for decades. For a while in recent years, voters showed a propensity for electing GOP governors as a check on the mostly Democratic Legislature. 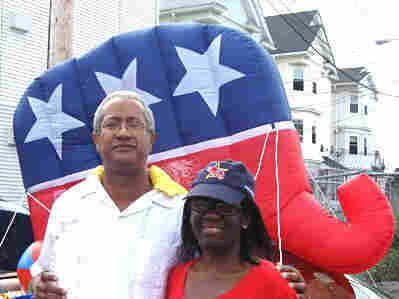 But as is true throughout New England, Rhode Island Republicans have become nearly an endangered species. The governor, Lincoln Chafee, is an independent who had served in the Senate as a Republican but was defeated in 2006 largely because the GOP brand had become so toxic in the state. Clanton says one of the most difficult aspects of her job is trying to convince candidates they have a realistic chance of winning if they run under her party's banner. Too often, she notes, even those who generally share the party's philosophy find it easier to run as an independent or even a Democrat. And it's hard to make the case to younger voters that the party has anything to say to them. "It's tough going out there and recruiting people," Clanton says. "It's very hard. We have a lot of Democrats who we know are Republican but run as a Democrat — basically so they can win." Clanton picked up the politics bug attending Howard University in Washington, D.C. She says it's not only important to advocate for the positions she believes in, but "an honor and a great opportunity." "I get a lot of flak from people," she says. "It can be very lonely at times, but it's what I believe in. I believe in a two-party system." Anyone in politics can tell you it's a lot more fun to serve in the majority than the minority. As a state legislator, Wallace Collins experienced life both ways. For most of Oklahoma's history as a state, Democrats ruled the roost. Like the rest of the South, however, over the past 20 years the state has increasingly given its support to Republicans at all levels of politics. "Oklahoma's the reddest of the red states, a dubious honor," says Collins, who is chairman of the state Democratic Party. His party is completely shut out of the state's congressional delegation, as well as all 13 statewide offices. It also holds few votes in the state Legislature. That's why Collins' strategy is to rebuild in "baby steps." "The way we lost control was a little bit here and a little bit there," he says. "We'll get back the same way." 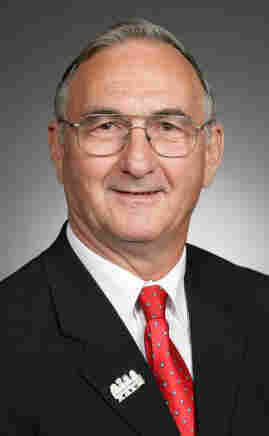 Collins became the Democrats' top official in 2011, shortly after losing his seat in the Oklahoma House. He inherited a party in disarray. "The bar was pretty low when I took over, so I felt like there's just one way to go, and that's up," he says. Ask him what improvements he's actually been able to make, however, and most of them turn out to be managerial — updating the phone system at the party's headquarters in Oklahoma City, for instance, or retiring its debt. He's the first to admit that accomplishing things such as recruiting and running winning candidates in such a highly conservative state is a longer-term challenge. Taking back the Oklahoma House and Senate, he concedes, won't happen anytime soon. But he remains upbeat. He has to. "You're not going to get anywhere if you say, 'Woe is me, we don't have a chance — but give us some money,' " Collins says. 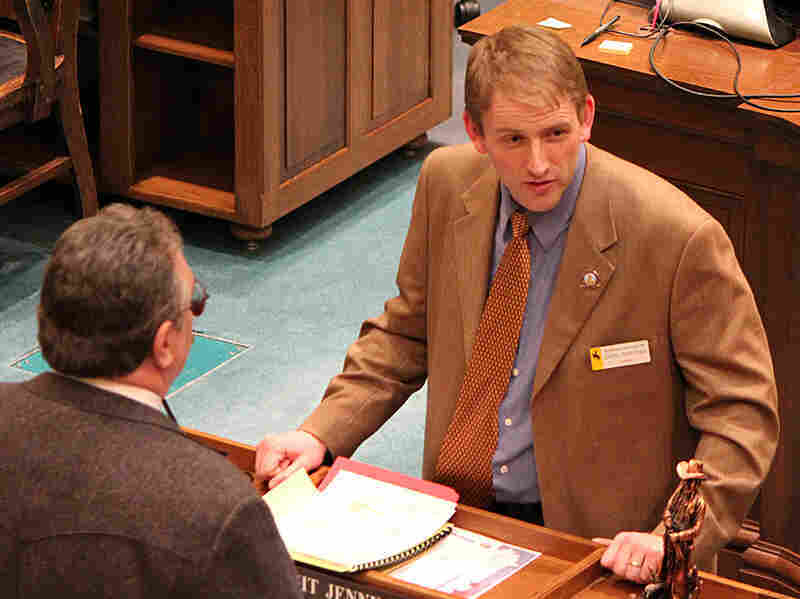 Chris Rothfuss is the Democratic leader in the Wyoming state Senate. There wasn't a lot of competition for the job. Democrats hold just four seats in the chamber. Republicans have 26. "When you're a caucus of four, you can all be on the same page pretty quickly just by looking around and nodding," Rothfuss says. Wyoming gave a bigger share of its vote to Republican Mitt Romney last November than did any other state, save for neighboring Utah. Democrats might have made some inroads in the southern Rocky Mountain states, but not farther north. While it's easy for the small band of Senate Democrats to reach agreement, the fact that there are so many Republicans means the GOP often splits into opposing camps. When the party's more libertarian wing does battle with social conservatives, it will sometimes turn to Rothfuss and his colleagues to help break the tie. "They'll try to get our four votes if there's disagreement among the factions in their party," Rothfuss says. "It's surprising how often that happens." The rules of the Wyoming Legislature are open enough that even Democrats can sometimes tweak bills, if the GOP is split. But outright victories are few and far between. Last week, Cathy Connolly, one of the few Democrats in the state House — they are as badly outnumbered as their Senate brethren — managed to push a domestic partnership bill through a committee. Two days later, it was killed by the House as a whole. Like a lot of red-state Democrats, Rothfuss represents a university community, in his case Laramie. But he gets a lot of email from Democrats from around Wyoming who are looking to have some kind of voice in the state Capitol. "Obviously, even if you're not going to win the vote," Rothfuss says, "it's important to have both sides of the debate presented so you have a better discourse." Sam Slom sometimes likes to refer to himself as the Lone Ranger. 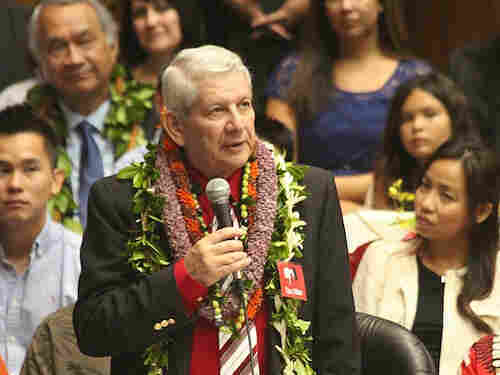 He's the one and only Republican in the Hawaii state Senate. "When that happened after the election of 2010, I got condolence calls and sympathy calls," he says. Slom doesn't want people to feel sorry for him, though. Although he jokingly refers to himself and his fellow legislators as "morons," he's a believer in public service. "If you look over the 16 years I've served, you'll find very few bills that have my name on them," he says. "You'll find a lot more that were my bills originally that my colleagues were so enamored of that they put their name on them." Slom doesn't care about getting credit. In fact, he describes his biggest frustration as his inability to fix problematic bills put forward by others. When he points out mistakes to Democratic leaders, he says, they dismiss his concerns, noting that they have the votes to pass such bills as is and can vote to approve changes later if they need to. Even though he's outnumbered 24 to 1, Slom says it's important that he brings a businessman's perspective to Senate debates and helps shine a light on Democratic excesses. He says he was raised by his parents to believe that if a job needs doing, you have to step up and do it yourself. "Life is all about the hand that's dealt to you," he says. "I'm good-natured about everything."